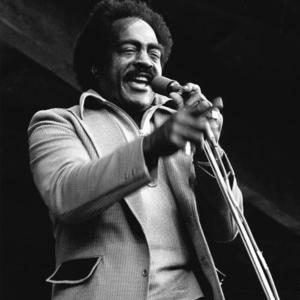 Jimmy "Spoon" Witherspoon (8 August 1920-18 September 1997) was a blues and rnb singer. Witherspoon was born in Gurdon, Arkansas, his father - a railway worker - sang in local choirs, and his mother played piano. He didn't pursue music professionally until after his stint in the Merchant Marines in World War II. On his return to the Unites States in 1944, he replaced Walter Brown in Jay McShann's band, and performed with Big Joe Turner and T-Bone Walker. Witherspoon was born in Gurdon, Arkansas, his father - a railway worker - sang in local choirs, and his mother played piano. He didn't pursue music professionally until after his stint in the Merchant Marines in World War II. On his return to the Unites States in 1944, he replaced Walter Brown in Jay McShann's band, and performed with Big Joe Turner and T-Bone Walker. Witherpoon's first hit record was "Ain't Nobody's Business", which he followed in 1949 with a reworking of the Leroy Carr song "In the Evening When the Sun Goes Down". His hit "Ain't Nobody's Business" was one of the biggest records of the era, and stayed on the Billboard charts for 34 weeks. Spoon made at least 200 recordings, and was one of the few true giants of the post-war blues boom. Witherspoon recorded for a variety of labels through the 1950s, including cornerstone sides with Swingtime, Federal, Chess, RCA, and even a Dixieland session with The Wilbur de Paris New Orleans Jazz Band for Atlantic in 1956. His long career included performances on jazz stages around the world, from Carnegie Hall to the Newport Jazz Festival, touring Japan with Count Basie, and European tours with Buck Clayton's All Stars. Witherspoon managed to span the worlds of blues, R&B, and jazz with his deep baritone voice and unique style. Witherspoon died in Los Angeles, California at the age of seventy-seven.